Not pictured: Governor Quinn a step ahead of Rahm. There are so many delightful ironies in that slick maneuver Governor Quinn pulled on Mayor Emanuel last week that it's hard to know where to start. So let's start here . . . It was a blast watching the governor, supposedly a clumsy political oaf, outfox the mayor, supposedly the slickest political operator in town. Just call him GQ—'cause he did it with style. In that maneuver, Quinn made a last-minute appointee to the Illinois Sports Facilities Authority, giving him the four votes he needed to install his own executive director as opposed to the one Mayor Emanuel wanted. The ISFA is the entity that doles out tax money that we, the taxpayers, can't afford to spend on sports teams, who don't need or deserve it. Like the White Sox, the Bears and, if Mayor Emanuel gets his way, the Cubs. Back to the irony . . . The man used by the governor as a pawn in this larger political chess game was none other than the legendary Dr. Quentin Young, who, at age 89, is one of the great leftists in recent Chicago history. Right up there with Studs Terkel. Somewhere Mayor Washington—once one of Young's patients—must be smiling. Mayor Emanuel and his backers on the facilities authority were shocked—shocked! I tell you—that someone in Chicago perpetrated a slick political maneuver. Someone other than themselves, that is. That was one helluva fast one Mayor Emanuel pulled on the preservationists when he got his Landmarks Commission to effectively give Northwestern University permission to destroy Prentice Hospital, a historically valuable building. In that slick maneuver, the mayor used the members of the Landmarks Commission as his own little chess pieces. Well, every commissioner except Christopher Reed, who voted his conscience. Proving that in all of Chicago there is exactly one appointee who is not a rubber stamp. Let's hope Dr. Young makes it two. Back to the facilities authority . . .
How about those crocodile tears shed by the mayor and his friends 'cause the mayor's pick—Diana Ferguson—was somehow eminently more qualified than the governor's pick, Kelly Kraft, who got the gig. "The qualifications between these two candidates for this position are not even remotely close," said Jim Reynolds, an Emanuel appointee. "For us not to choose Ferguson is just an inappropriate use of the authority." Well, I hate to be the one to break the bad news to you, Mr. Reynolds, but . . .
Chicago has never been, nor will it ever be, a meritocracy where the best and the brightest compete for the honor of running boards, departments, and/or agencies. It is, instead, a bossitocracy. You get where you are by who you know and how you know him—which is, now that I think of it, how Mayor Emanuel got to be mayor. As Mick Dumke and I may have already mentioned. As for whether Ferguson's better than Kraft at bookkeeping or marketing or long division, it doesn't really matter. The main quality the mayor wants in his appointees is a willingness to do what he says no matter what he says. And then take the fall, if it comes to that. But enough about Jean-Claude Brizard's reign as CEO at the Chicago Public Schools. In the case of the ISFA, Mayor Emanuel apparently wants to hand public money over to the Ricketts family, who have plenty of money of their own. Thus, the public will help pay for a Wrigley Field fix up, so the Ricketts clan can make even more money peddling a mediocre product to the mopes who flock to watch the team play. Great job on another losing season, Cubs. 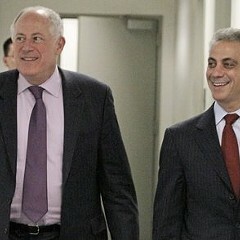 If Governor Quinn stands tough on his opposition to the Wrigley Field handout, then I say hip hip hooray. Go get 'em, Kelly Kraft! 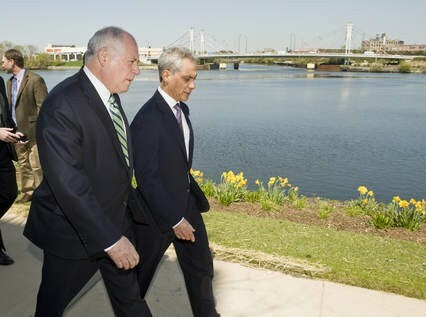 Of course, there's always the chance that Governor Quinn will eventually fold under the mayor's relentless pressure. If so, my bet is that Dr. Young will be the one authority member we can count on to take a stand on behalf of the taxpayers. Did I tell you Dr. Young marched with Dr. King? Like I said, the man's a legend. Stand tough, Governor Quinn. Better the sports facilities authority do nothing then take money from our schools and give it to the Cubs.